HOLLYWOOD—Ringo Starr is still rockin’ at 73. The former Beatle kicked off a day of media interviews tied to the publication of his visual autobiography, “Photograph,” and his All-Starr Band tour of South America and Mexico. Dressed in his usual all-black, Starr appears that despite 50+ years of performing, he is showing no signs of slowing down. He and his band of fellow rockers are playing at various venues in South America and Mexico for 14 shows through Nov. 18. The only two American dates are at The Palms in Las Vegas Nov. 22-23. The All-Starr Band features guitarist Steve Lukather (Toto), bassist Richard Page (Mr. Mister), keyboardist Gregg Rolie (Santana), famed guitarist Todd Rundgren, saxophonist Mark Rivera (Hall & Oates) and drummer Gregg Bissonette (Jughead). During a brief question and answer period, Starr and his band mates spoke about what inspires them, how they continue to play together since they joined forces in 2012 and why Latin America. Q: You sounded great. I want more! Starr: Come see us in Peru. Q: What keeps you guys going? How do you keep up the energy? Do you rely on each other? Is it really a little help from your friends? Starr: I speak for myself when I say I have nothing better to do. It’s a dream for me. From 13, I wanted to play the drums. I wanted to play with good people and I’m still doing it. I still love it so that’s why I do it. Rundgren: My personal energy doesn’t kick in until much later in the day. Starr: He lives in Hawaii. Rundgren: But I’ve said it before and I will say it again, it’s the best band that Ringo has ever had, not just from the standpoint of playing together, but also I was never in one of the bands before where we all hit the last beat together and where we all spend our time on the road together. We don’t hide in our rooms from each other. We’re all friends all the time. Again, that’s the thing that gets you excited to play because you’re playing with your best friends. Rolie: It’s a great honor for me to be here with Ringo and with all the great friends that I’ve made in the last couple of years. It’s sort of been like the songbook of my life. I learned playing all these songs from these guys. What can I say? It’s truly a vacation and not work. Q: The All-Starrs have been in one incarnation or another since 1989, and you seem to be able to get together and play well together. Are there any egos that you have to brush aside so you can jam together like this? Starr: We jam together a lot. Todd put it in a nutshell, this band musically is all great players and all great musicians, but the spirit of this band is very close. And so, they do eat together. That’s how it is. This is just a really good band. Rundgren: Every once and awhile we get a ringer. He’s got a name, and he’s got three hits or something like that, and that’s our function in terms of the band. But I think in this particular band, we all have strengths that the others are more or less in awe of in a way. Each one of the guys in the band can do something I can’t possibly freakin’ do, and that keeps you respecting everyone in the band. We don’t want people showing up just shucking their way through the show. We’re all on top of it. Q: Ringo, do you still have a camera and are you going to take pictures of this group? Starr: No. It’s great that you mention it. I do have this book coming out that has a lot of photographs that I’ve taken over the years, but I sort of slowed down a bit on that because I realized that I was so busy taking photos or videoing what was going on that I wasn’t actually at the party. So now I’m more at the party and I take pictures anyway. I don’t take as many as I used to. Q: Is there was one photograph in particular that if you could go back and live that particular party or that particular moment, which one would it be? And how to you pick the songs to play in concert? Starr: You have to have hits to be in this band. That’s what it’s all about. We’re all the best 1/8th of the band in the land. We start with that and I need musicians as well so I get lucky when I get great musicians with great songs. So that’s how I do it. And thank God they all agreed to do it. (As for the photo), I’d like to go back to that moment (he points at a picture of a 20ish black and white image of himself) and wonder, what the hell was I thinking? But I know you’re talking about with the other shots (from the book). Those moments are gone. I’m just lucky I captured those moments because I got a lot of stuff over the years. So, you see a photo and instantly it brings you back, , a lot of the Beatles shots. In fact, what’s more interesting to me are the shots outside the car, because we were always in the car, all four of us, going wherever we went. But when we were in New York, there were a lot of pictures of the kids looking out their window chatting to us. That was all exciting at the time. So that gave me a lot of freedom to take because you didn’t have the chance in the 1960s to really wander around and take the shots, which I have now. But anyway, Book 2 is coming out in December and you’re gonna love it. Q: Is there a possibility of an extended engagement in Las Vegas? Starr: You mean like a Golden Drums (show)? Like (Elton John’s) Red Piano? Golden Drums—14 year later! It’s been talked about but nothing’s been finalized. It’ll be a couple of years before that happens. So the answer is, not yet. Q: What do you expect from South American audiences? Starr: I haven’t been or played in South America until two years ago. When I played there, it blew me away. The energy of the audiences was so great and so loving. For every gig, the energy from the audience was so great. That’s what I brought back from there last time. We’re going back and let’s hope it’s the same. We’re taking Gregg Rolie who has a Spanish number. (He laughs.) Tell them about it, Gregg. Rolie: The one thing I remember about “Oye Como Va” is Carlos (Santana) brought it into the band in I guess it was 1970. My first inclination was, “What the hell do I do with this?” It was a Tito Puente song and I was writing things like “Hope You’re Feeling Better” and rock. They brought this in and it turned out to be one of my favorites. And so, we’re going to take it down to South America. We were doing everybody’s everything, and I said, “Ringo, you’re the boss, but if we went to South America and played ‘Oye Como Va,’ I think they might go nuts.” And he goes, “Done!” That’s how this happened. Starr: Anyway, to answer your question, the energy down there was an incredible memory for me from last time. When we go, we’re a working band. We’re a touring band. So we go to the gig and we do our best, and the reaction was great last time. Q: In Mexico, you’re very popular not only because of The Beatles, but because you shot “Caveman” in Mexico. Q: What is your overall impression of Mexico over the years? Starr: I’ve always had a good time there. I spent a lot of time in Las Brisas, of course, or as we like to say, Lost Brisas. Those were the days when I used to be a big fan. I’ve always had a good time down there. And it is interesting to me because that’s where (my wife) Barbara (Bach) and I really met doing “Caveman” which is a well-known classic movie. It was 33 years ago, and we’re still together. So that’s great. Also, it’s a great movie. Q: Do you think because you’re sitting back there and you’re so observant of everything that that’s why you’ve enjoyed doing the stories and the pictures and all of that over the years? Starr: You mean sitting on the drums? Well, looking at some of the documentaries out there like The Eagles one and the Police film that Stewart Copeland did, he must have been filming them as they were playing. I wish we’d had done some of that. It really is exciting. I sit back there because I’m a drummer. That’s where we live. I’ve seen some drummers filmed and it seemed crazy. We’re going to have great fun in South America. Q: It’s been five years since you pledged not to give autographs. With the Genesis book (“Photograph”), you’ve been signing a lot of autographs again. Did your hand go into shock? How did you feel about doing all of that? Starr: You have to watch when you do a lot because it turns into doggy doo. But it’s for a good cause. It’s for the Lotus Foundation (charity) so that’s why I sign. I just don’t sign on the street anymore. If you catch me with a bit of tissue, I don’t sign outside of that anymore. Mainly, I sign for the good cause that we can contribute whatever we get back. In all honesty, and even “The Simpsons” have noted this, I’ve signed enough. Q: If Paul McCartney asked you to join his band, what would you say to him? 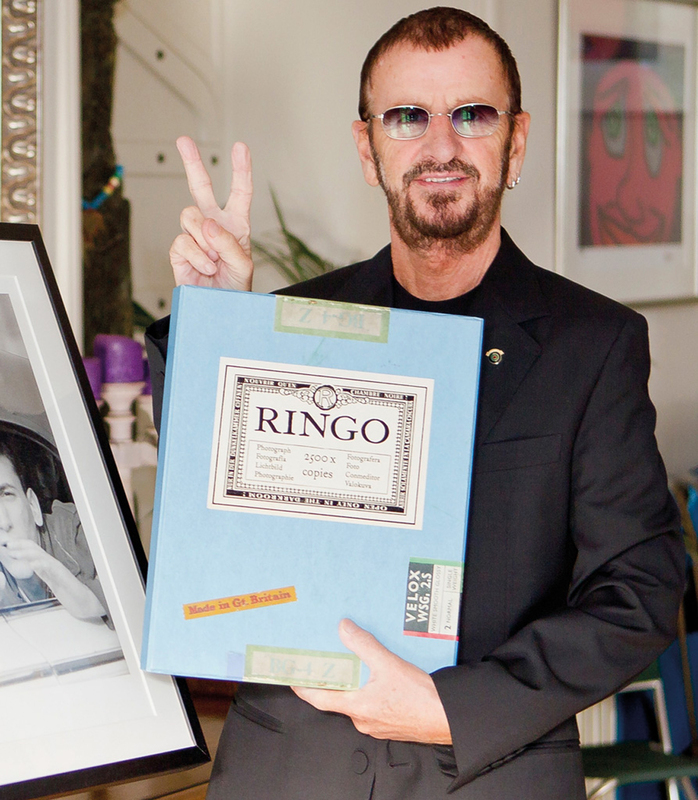 Starr: Well, yeah, that would be good, but he’d have to call it Ringo’s.